Zestaw dodatkowy do tworzenia talii*. • Opakowanie stanowi zarazem pudełko do przechowywania kart. *Do gry wymagane jest posiadanie pełnej wersji Acension. Grab some friends and compete for dominance as two-player teams. 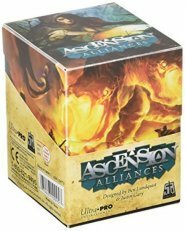 Ascension: Alliances brings multiplayer to all your favorite Ascension sets! Ally Unite keyword brings a new twist to a fan-favorite mechanic! Converts ANY of your existing Ascension sets into a multiplayer team experience! Comes in an Ultra PRO 100+ count deckbox with divider inside.